Members of the community who have lost family and friends can write the names of their loved one on a remembrance ribbon, tie it to the arch and have moments of personal reflection. Faith & Grief Ministries recognize that the holiday season can bring sadness and a swirl of conflicting emotions for those who are grieving. The Memorial Arch provides a place to remember your loved ones by writing their names on ribbons and tying them to the arch with names of others who are remembered. This incredible, artistic Memorial Arch will stand throughout the month of December. Faith & Grief Ministries has created this event at the east end of Klyde Warren Park from Dec. 1 – 22 from 11 a.m. to 6 p.m. to help those through healing and comfort. 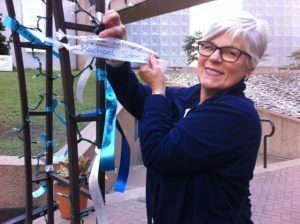 During that time members of the community who have lost family and friends can write the names of their loved one on a remembrance ribbon, tie it to the arch and have moments of personal reflection. Faith & Grief Ministries is also hosting three multi-faith memorial services of remembrance. Dec. 3 at 6:30 p.m. This multi-faith service provides a space for individuals, families and communities to gather as one to remember the lives of the departed. On the day the nation remembers the brave men and women who fought at Pearl Harbor, Faith & Grief Ministries will gather again with the members of community to honor all veterans who have served our country. The Heritage Brass Band, comprised of 30 plus veterans, will perform. Dec. 18 at 6:30 p.m.
On the longest night of the year, Faith & Grief Ministries will host the last multi-faith prayer service to acknowledge the pain that loss brings and to cling to the hope for those struggling through grief through the holidays. All events will take place at the east end of Klyde Warren Park at 1909 Woodall Rodgers Fwy. in Dallas.